March was a busy month, mainly preparing for and hosting a weekend seminar with guest instructor, Harvey Konigsberg Shihan. The timing of the seminar was a little strange, since we agreed on the last weekend in March which, unbeknownst to us back in November, was Easter weekend. Important lesson: cell phone calendars don’t show holidays. By the time we recognized the issue, invitations were out and travel reservations were made. Too late to change the dates. Nonetheless, the seminar was a success, with more than 40 people attending over the weekend. Konigsberg Sensei also taught two evening classes before the weekend with about 15-16 dojo members attending. 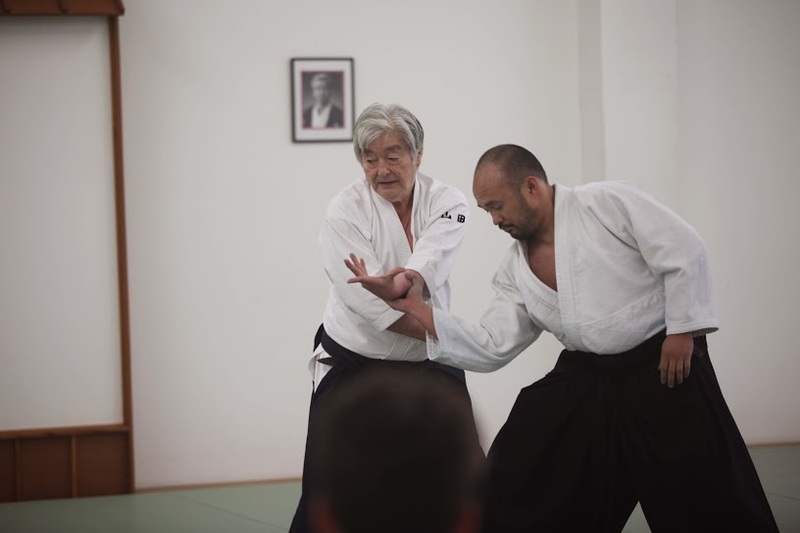 Throughout the seminar Konigsberg Sensei emphasized two important points: 1) nage moves at the moment of contact without focusing attention on the attack, and 2) nage moves to a position and posture that disallows uke from striking with either hand. These points are not novel, but implementing them (especially #2) often requires some nuance of body posture, size and shape of footwork, and/or positioning of the arm/hand to better undo uke’s posture and prevent a counter attack. Implementing on these criteria, Konigsberg Sensei’s techniques are very dynamic and effective. The question arose, however, how to best teach novice Aikido students. Konigsberg Sensei commented during the seminar that nage’s movement at the moment of contact is usually not the best way to teach beginners. For the first several months most novice students often have great difficulty with the counterintuitive movements in Aikido. Asking these students to move at the moment of contact would cause even more confusion. “Kihon waza” (i.e., basic technique), as it was taught by the late Morihiro Saito Sensei, typically begins with a static attack (at least for the grabs) that requires the nage to move from the center in a very particular direction without using muscle force. Over time, this approach refines proper positioning and posture and optimal angles of movement. Depending on the degree of athleticism of the individual, even performing these basic techniques at a modest level of accuracy can take months-to-years of consistent training. I have trained Olympic-level athletes who go through the same awkward period as beginners in Aikido, but usually struggle for only several weeks instead of many months or years. From an instructor’s perspective, then, the question arises when and how to introduce newer students to performing “ki no nagare” (flowing movement) techniques. The answer is: it depends on each individual student’s rate of progression. While I believe it is important for instructors to, at times, motivate students to perform at the outer edge of their capability or a little beyond, it is also important for students to continue to refine their kihon waza. Perhaps the rank testing regimen can be useful in individualizing this process. At 5th Kyu (the initial rank test), which usually occurs at 6 months to a year of consistent training, techniques are performed as kihon waza. By the next test, 4th Kyu, which typically occurs during the second or early third year of training, students are now asked to perform techniques more as ki no nagare. Because the timing of these tests is determined not only by the number of practice days but also by the readiness of the student for the test, this will individualize the transition toward the goal of moving at the moment of contact. Thus, we are using the testing process as an important tool to help students progress along the path.